March 20, 2018, Wilmette, Illinois – March brought special opportunities for Regina Dominican High School students to learn about the Adrian Dominican Mission and Vision, spend a day in service to elementary school children, and voice their protest of the gun violence that is plaguing the United States. In recognition of National Catholic Sisters Week, five Regina Dominican High School students spent March 9 in a day of service. National Catholic Sisters Week was inaugurated in 2014 by the National Catholic Sisters Project to highlight the lives and ministries of Catholic Sisters in the United States. The day of service was funded by a grant from the Hilton Foundation, whose goal is to raise awareness of the contributions of women religious in the United States. The girls stopped first at Visitation School, sponsored by the Sinsinawa Dominican Sisters. Sister Jean Matijosaitis, OP, who has ministered as principal for 30 years, greeted the girls. She drew attention to a visual of all the women from Visitation School who entered the Sinsinawa Congregation and those who taught at the school during the past 127 years. Jena Markoff, Assistant Principal of Visitation School and a 2002 alumna of Regina Dominican High School, related memories of attending Regina Dominican and her journey from there into a leadership role in a Dominican-sponsored school. The girls were captivated by Jena’s stories about her teachers, some of whom teach the current students. Regina students tutored second and fourth graders alongside a Campus Ministry Service group from DePaul University, who spend their Friday afternoons tutoring the children. Sarah Pereira, a Dominican Volunteer, told about her ministry at Visitation and treated the girls to ice cream. Before the students left they interviewed, via Skype, Dominican Volunteers Zach Moeller and Elizabeth Drake, who assist refugees and immigrants for Catholic Charities. The Regina Dominican bus then headed to the Adrian Dominican Westchester Apartments to pray, enjoy pizza, and share stories with the Sisters who live there. Prayer began with a message about NCSW from Sister Patricia Siemen, OP, Prioress of the Adrian Dominican Sisters, followed by introductions, and a reading about the call to share one’s gifts and talents with the people of God. After pizza and dessert, the Sisters shared their vocation stories. 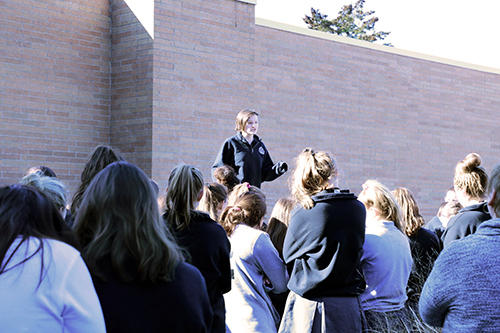 Junior Beth Gillespie leads a group of Regina Dominican High School students in the national 17-minute walk out in protest of gun violence. Regina Dominican students also had the opportunity to show their support for the students, faculty and staff of Marjory Stoneman Douglas High School and all communities who have suffered from gun violence. A number of students participated in the March 14 National Walk Out Day. Regina Dominican's plans for this day were largely driven by students, who proposed more than just a "walk-out." They used the 17 minutes as an opportunity to write letters to Congress, further educate themselves on processes of facilitating change in school safety, show support to the Parkland community, and pray for those affected by gun violence. Students could choose among four "walk-out" and "walk in" options: writing letters to Congress, praying, making cards for the Marjory Stoneman Douglas students, and walking out to the Panther Patio to make their voices heard. School counselors were on hand to meet with anyone who needed their services.